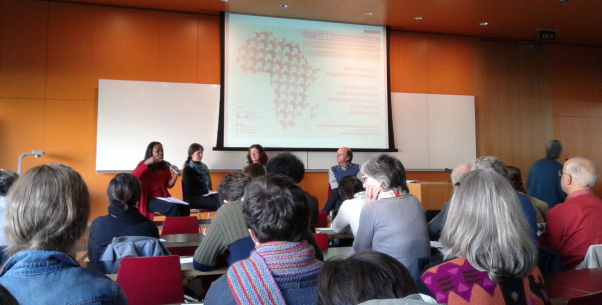 Symposium on Africa: help, cooperate or invest? 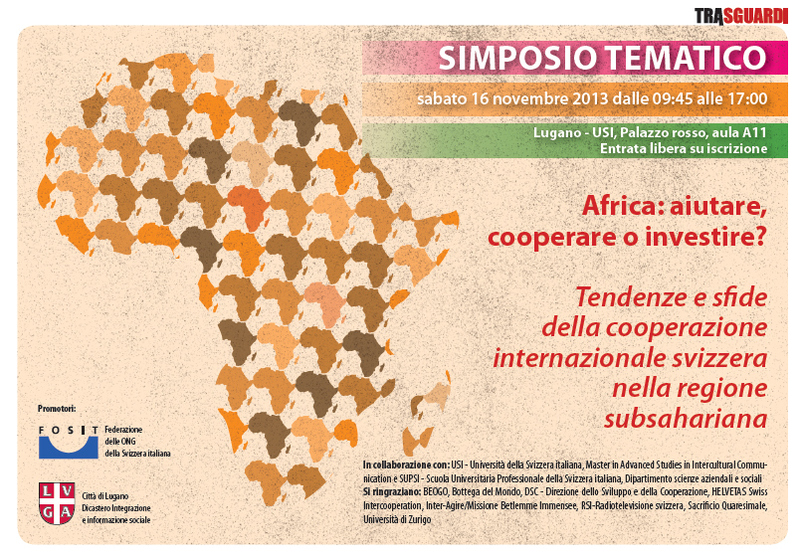 Last Saturday November 16th 2013, the Symposium “Africa: help, coopertate or invest?” took place in Lugano, organized by Fosit and MIC. It started off with an introduction to the topic by Prof. Veglio, president of FOSIT and professor at the university of St. Gallen, followed by a roundtable discussion. The guest speakers were Blandine Sankara (sister of the Thomas Sankara, President of Burkina Faso from 1983 to 198, murdered 26 years ago.) Prof. Katharina Michaelowa (ETH) e Chrystel Ferret (SDC); moderated by Roberto Antonini (TSI). In the afternoon, three different Atelier were organized. 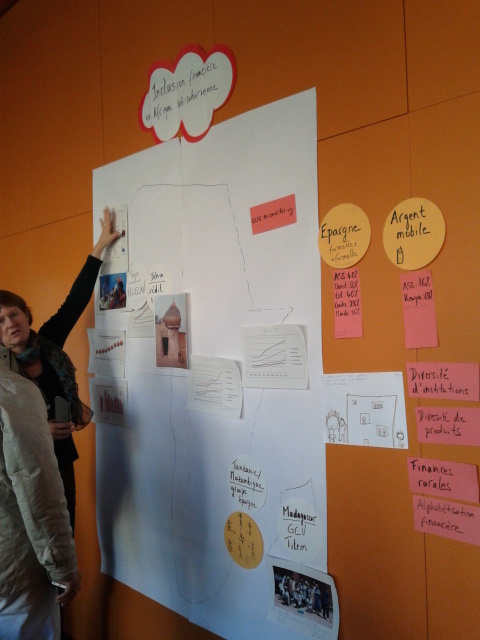 The pictures below refer to Atelier 2 on Microfinance. 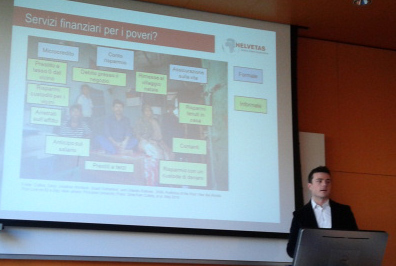 The topic was introduced by Damiano (student at the University of St. Gallen), who gave an insightful overview on the status of microfinance in the world. I particularly like the visualization below, which maps the situations in which people need (micro-)loans or other financial products such as micro insurances, and what elese they normally do if they can’t get them from a bank. Then Isabelle Dauner gave a talk on the topic of microfianance specifically in Africa, using a ‘analogue’ technique, drawing the ouline of Africa and then pasting different information, sldes, drawings and coloureful notes on the poster. The Khan academy is an incredible success story of education through new media. E-learining has promised to be the solution to a more personalized and affordable education. Yet, computers alone are not the answer. Salman Khan had this idea back in 2004, creating educational videos for his cousins, and uploading them on youtube. Now the Khan Academy is a non profit organization, supported by the Bill and Melinda Gates Foundation and other donors, and has over 3500 videos on any topic. But it’s not only about the videos: it is an integrated learning platform for teachers and students. Indeed teachers are assigning the videos as homework, and they are getting the students to do the exrcises in class, so they can coach them one by one. The platform provides exercises for students and track their results and progresses. Teachers can then check the performances of the students and interveen where needed. IADIS international conference ICT, Society and Human Beings 2011 stated Sunday July 24th with a beautiful opening session by the conference co-chairs Diane Whitehouse and Professor Emerita Gunilla Bradley, of the Royal Institute of Technology, Stockholm, Sweden. This is a good connection with my research topic, which is concerned with the use of visual representations for better communicating and engaging the audience. However Gunilla doesn’t need any additional aid for connecting with the audience: she is an explosion of energy, color, positiveness and a role model for all women in academia, especially in IT! Then the presentation session started with a couple of papers on facebook use (a hot topic!) and a brilliant study on “e-commerce trust beliefs & national culture” by Regina Conolly. In the afternoon Ashir Ahmed presented an interesting study of BoP, with a model of e-commerce for the unreached community, focusing on Bangladesh. Ana Gonzales provided insights on gender and mobility of ICT professional in Spain. Jorge Franco showed applications of ICT educational tools in primary education in Brazil, including the use of VRML virtual worlds created by the kids, and programming! In the evening Mauricio Velasquez gave a very informative talk on ICT4D (Information Communication Technology for Development), starting with the definition of development itself, which is not only concerned with economic development but more holistically on human development. He pointed out that the advancement of ICT allows for student-centered learning, however obstacles to the deployment of ICT are not limited to material resources as infrastructure and bandwidth, but also to immaterial obstacles, such as teacher training, the need of defining how to use technology for education (children access to the computers in not enough for appropriate learning). This year the Emergence conference, organized by the University of St. Gallen, has focused on India. The amount of knowledge on India of the speakers was astonishing, a conference of really high quality. I was pleased to see a large use of visual representations and sketching to moderate workshops. In the picture below the speakers of a workshop on microinsurance: Market based solutions at the base of the economic pyramid, used sketching and a poster with the Growing Inclusive Markets Strategy Matrix, a template developed by the UNDP (UN developing program) “for business trying to engage in BoP-projects or growing inclusive markets“. By the way the concept of the “Base of the pyramid” is a powerful metaphor in itself.